Got the Sniper installed, today, sans coolant sensor. I can't get the damn plug out of the intake. Why the hell did Edelbrock use a plug with a 5/16" square hole in it? Who has that socket? However, even without the system being able to learn, my truck runs better than it has since I bought it. 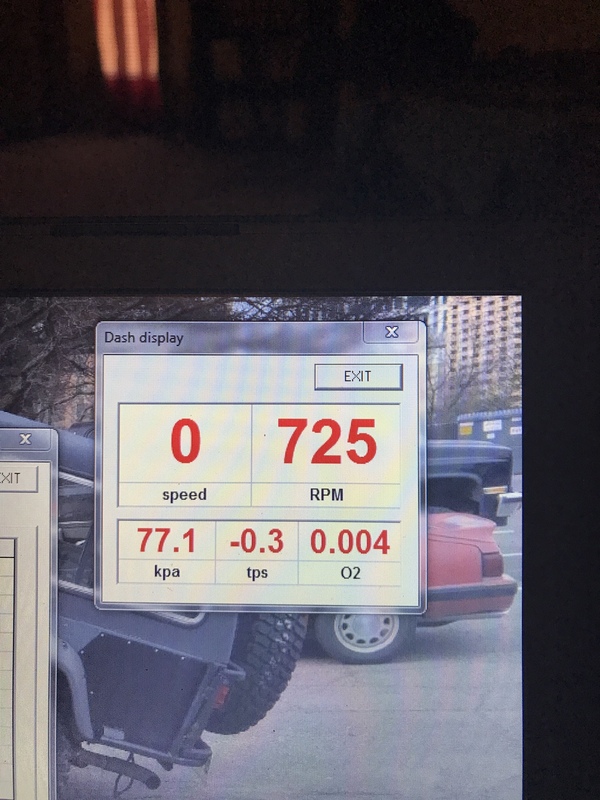 I finally believe what the PO said about 10.5:1 and a cam! First start was beautiful. Let it idle for a few and start warming up. Idle was high so lowered that. Target set at 580 to get 700. Tried the idle screw but couldn't get any lower. I might be doing something wrong. Have to look that procedure up, to see what I'm doing wrong. chevelles.com seems to have the most info, for anyone interested. Every start since, I have to hold the accelerator to the floor, and let off immediately after I hit start with the key. Pretty sure this is due to not having a CTS. But, if you know something I don't, let me know. 2005 KJ, Hit-n-Run, 2am 6-17-2012, Totaled. 1977 SJ J10, 4v360, T18, D20, 37x14s, SOA & SF on tons, still ugly. Congrats man! Must have been a good day for fuel injection. I followed the directions on mine and set it to +\- 500 rpm. When I plug it back in (following the procedures) it ends up at about 700. Maybe we are both doing something wrong? possibly. Let me know if you figure it out. For the moment, I can live with it. I believe that without a CTS signal, the system assumes a super hot engine temp, thus the need to floor it (Clear Flood) in order to start. Tatsadasayago wrote: I believe that without a CTS signal, the system assumes a super hot engine temp, thus the need to floor it (Clear Flood) in order to start. The screen grab shows coolant enrichment at 120% and a richer AFR being commanded. I think the computer is seeing a COLD engine instead. Thus, it's trying to dump fuel in to start a cold engine and that is why the "clear flood mode" procedure is working. LOL! Good news is, most likely one of us is right! LOL!! My bad, I got it backward. Wide open throttle stops almost all fuel flow until the engine starts. Makes total sense. Yes, without a CTS signal, the system thinks it's -40. Sorry for sharing bad intel. Which plug is it? Got a pic?? Coolant port in the intake. Tapered pipe thread with square hole. Should be able to use a 3/8 ratchet (or extension), no??? Tried grinding down a 3/8" extension, just kept breaking the tip off of it. Hmm.. that's weird. How about an EZ out?? Thanks! Went and dropped the start-up enrichment. Seems to be the right direction. Got a couple restarts out of it that didn't require messing with the pedal. As for the plug, I'm gonna make a tool, first. I work on a CNC mill that doesn't have anything to do until Wednesday, and they trust me with a key to the building. If 4340HT isn't strong enough; easy-out, even heat may come into play. In the meantime, spray the hell out of it with PB blaster! Try a 3/4 drive ratchet. What I used was a large Bolt and ground down the shaft to fit it and I put two nuts on the threaded piece and use the lower nut to back it out. It is actually a plug usually used by plumbers so I think a plumber shop should be able to assist you. Not sure if Holley changed sources for the coolant sensor but, mine appears to be perfect. Exactly where my engine should be, maybe even hotter than actual. Very happy, now!!! Thank you, guys.